Hi again! Here in Karber we have a new section called "Karber Customer Spotlight". 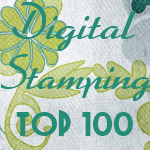 We love the cards and projects you create using Karber Digital Stamps & Karber Rubber Stamps. A big thank you to Patricia for sharing her artwork with us. woww patricia's work are great. Wow Patricia rocks, what an awesome job on all of her projects... way to go girl! Patricia, these are just impeccable! I especially love your coloring! Wow these projects are awesome! So cute Patricia and such great colouring! The cards are wonderful!! Love all of them but my favourite ones are the notebooks! soooooo great!